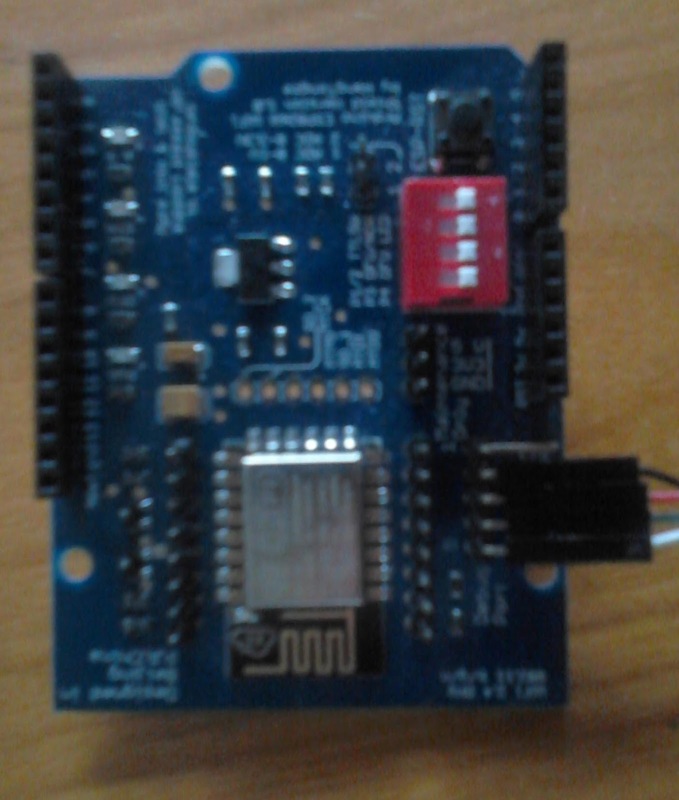 To use with Arduino Uno / Genuino i did buy a time ago this ESP8266 Arduino Uno Shield. As there are more shields and Arduino ESP8266 combinations. ( and a discussion on http://www.esp8266.com/viewtopic.php?p=41311 ). With an Arduino Uno i could not easy figure out how to make it work or find a working ready to go example project. 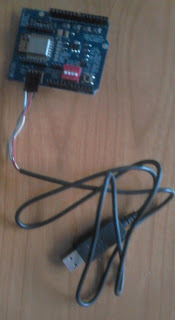 I decided making it work "stand alone" first (without Arduino) connect it using the maintenance port. and set all the dip switches "DOWN"
Some of the lights went on when connecting the USB cable to my computer. I connected the Wifi with my smartphone. A port scan gave no open ports. Finally i decided to swat the TXD and RXD connections. Typing AT commands (also tried some other things) did not give results. DIP buttons DOWN DOWN UP UP ESP8266 Basic (4M) flashed (See previous article and ESP8266 Website for more details. Restart with DIP switches DOWN DOWN DOWN DOWN gave ESP Wifi signal. Configuring home network connection and tests with some basic programs (Wifi scan) went well. USB cable info did tell me that Green is the cable TXD line and White the cable RXD line. I trust this board more than the other board (that also had GPIO4 and GPIO5 swapped.) Therefore I expect the other ESP8266 test board RXD and TXD labels are wrong. A next step could be connecting the shield to Arduino and test communication to the Arduino. Swap the RX TX pins between the shield and the UNO -- take TX from the esp to the TX on the UNO and the RX to the RX. This way you can use the Andrino IDE (with a empty sketch) to communicate with the esp.